Historians of 20th century fascism have repeatedly shown how fascist takeover of state power was dependent on the complicity of groups and classes that were not otherwise fascist. Describing key conduits between open fascists and the current US administration, and the ties of major arts philanthropists to this administration, this talk raises the spectre of neofascism as a real danger against which to measure present events. Using arts organisations as a case-study, Dr. Nizan Shaked shows how the US state structure, which relies heavily on a third sector through the nonprofit system, is a conduit to excessive privatisation, and how privatisation relates to what I call ‘econo-fascism’. This reveals the common agendas of the patron class and a liberal world view that hopes to represent the middle class (or the petty bourgeoisie), and that purports (but fails) to serve the working classes. 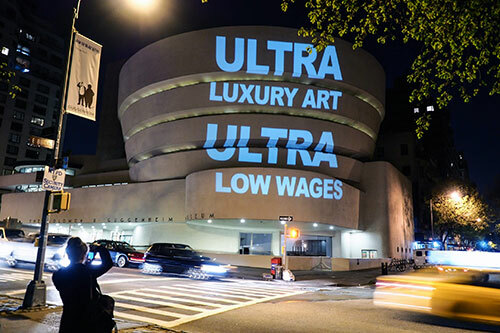 I argue that the liberal quest for a so-called civil debate that is prevalent in the discourse of arts and its administration, misplaces the real site of struggle, which is the alliance of neofascism with capitalist interest. Dr. Nizan Shaked is professor of contemporary art history, museum and curatorial studies at California State University Long Beach. She is author of The Synthetic Proposition: Conceptualism and the Political Referent in Contemporary Art (Manchester University Press, 2017), and is currently working on Museums, the Public, and the Value of Art: The Political Economy of Art Collections, forthcoming with Bloomsbury Academic.